If you have visited Crucible Theatre, why not submit your image of the view that you had. 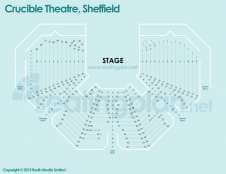 Where are the best seats at Crucible Theatre? Visitors to SeatingPlan.net haven't yet rated any of the seat blocks at Crucible Theatre. If you've visited Crucible Theatre, why not submit a picture of your view and rate it! Entry to the auditorium is via the Green, Purple, Red, Orange or Blue door. The Green door offers access to early seat numbers. The Blue door offers access to high seat numbers. Row A is closest to the stage area and Row P is furthest away. No spectator is more than 20m from the stage meaning the Crucible Theatre offers an intimate experience. Seats are numbered in a clockwise direction from 1 to 84 depending upon the seat row. Rows at the back of the auditorium have more seats due to the shape of the theatre. The Crucible Theatre is famous for hosting the World Snooker Championships. In early rounds of the championship two matches are sometimes played simultaneously, with a screen dividing the stage area. Seats numbered between 30 and 50 may give audience members the chance of both matches. The Crucible is situated in the centre of Sheffield, close to the Millennium and Graves Art Galleries and the Central Library. The main theatre entrance is in Tudor Square, is accessed on foot from Arundel Gate, Norfolk Street, or Surrey Street. The Crucible theatre is part of the Sheffield Theatres Group and works in partnership with Q-Park, to provide parking in Q-Park's Charles Street car park. We currently do not have any events listed at Crucible Theatre, please click on a seating plan for more information about seat locations at Crucible Theatre.